The swing may be coming along nicely, the approach shots testifying to your familiarity and skill with the woods and irons in your bag. But it will be on the green where those who have got what it takes come to the fore.Yes, there is a basic technique to be employed when putting, which we will come to in a minute. But the key quality displayed by those who have got it down to a fine art is that they possess the one characteristic that can't be coached: nerve. Some of the greatest golfers have found the psychological challenge of putting too much at times. This condition has a name: the Yips. And when it strikes it can have a devastating effect on a scorecard. In simple terms, the Yips is a breakdown in communication between the head and the hands, leading to mis-hit or rushed shots that can account for a relatively simple putt turning into three or four strokes to get the ball in to the hole. You won't know you are susceptible to the Yips until it happens, but once it does it takes a great deal of resolve to escape its clutches. Anyway, enough of the horror stories. Let's get back to basics. What you are looking to achieve in terms of putting action is a pendulum action, the club swinging the same distance in terms of both backswing and follow through with no input from the wrists. There are a number of grips that can be employed, many dependent on the type of putter that you are using, but the basic method involves the thumbs positioned in a straight line down the front of the shaft, the thumb of the lead hand tucked into the back of the palm of the trailing hand. Place the ball just forward in the stance so that the face of the putter makes contact slightly on the upswing, thereby promoting a forward roll. Keep your eyes firmly on the ball as you strike and don't be tempted to raise your head up too soon. Of course, the whole process would be much simpler if course designers made every green as flat as a pancake. But where's the fun in that? So you are going to have to learn to read the green, taking time to look at the line from the position of your ball to the flag, taking note of the dips and slopes that will influence the path of the ball once it is in motion. If you are playing the same course on a regular basis, over time you will become familiar with the physical characteristics of individual greens. There is another element to consider, namely the weather. Dry greens run fast; wet ones slow, so take this in to account when deciding on how hard you are going to hit the ball. Note, too, wind direction and severity and how this is going to influence the speed of the ball and its path. 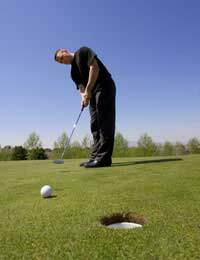 Practice, naturally, is very important but you'll only really know whether you can cut it with a putter when the pressure is on.